Helping children learn how to be safer in everyday situations is a key issue for parents and teachers alike. The Kidsafe approach is committed to making children more aware of, and so more prepared for the dangers they may face. Integral to their philosophy is the idea that learning should always be fun and not dampen children’s sense of adventure. To that end, the Kidsafe initiative aims to get important safety messages across to school children nationwide in an interactive, enjoyable way that they will remember. 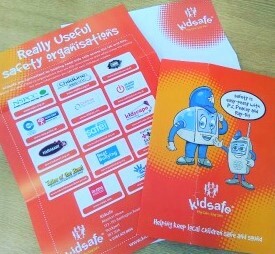 Kidsafe was founded in 1996 with a pledge to help keep children safe across the UK and Eire and has developed unique ways to inform, entertain and engage school kids. The ‘being safe is fun’ mind-set is at the core of their campaigns. Axair are very proud to support the Staffordshire branch of the organisation by sponsoring the production of Kidsafe School Safety Packs. The packs contain games to convey messages and important information regarding stranger danger, vandalism, crime prevention, racism, beating bullying, drugs, road safety and the green cross code. They also list safety organisations that are particularly relevant to young children for them to take home and keep. To find out more about the Kidsafe initiative or look into supporting the cause, you can visit their website www.kids-safe.net or email info@kids-safe.net. This entry was posted on Monday, August 20th, 2018 at 10:15 am and is filed under Company, Environmental. You can follow any responses to this entry through the RSS 2.0 feed. Both comments and pings are currently closed.